The Weber 741001 Original Kettle 22-Inch Charcoal Grill is the original legendary kettle charcoal grill that everyone has had in their backyard for decades since the 1950’s exactly. Except this is the bigger brother at 22 inches in diameter and a larger 363 square inch grilling area with rust resistant vents and a steel plate cooking grate. So, what’s new? A lot of minor changes to make it the most durable and easy to use charcoal grill available. However, it’s still the backyard icon we’ve come to trust and depend on for easy operation and great tasting barbecue. Weber has combined its traditional design with innovative thinking to include one-touch cleaning with a removable ash catcher that makes cleanup a breeze. The Weber one-touch cleaning system allows for hassle-free cleanup and isn’t that what we all want during and after a barbecue. Three metal blades in the bowl move the ash when you turn the handle to allow the ash to fall into the fully-enclosed ash catcher so you won’t have ashes flying all over like on some other grills. The vent for the ashes acts like a second damper, when opened it can help circulate air up into the bowl to sear those burgers and steaks. Weber has made closed cover cooking an art form. It is one of Weber’s many signatures. Since the bowl and lid are made from porcelain-enamel coated steel it resists rusting and burn through, while allowing the smoke to circulate around under the lid but over and through the meat or whatever you’re grilling. The damper is what allows all this to happen, with the damper closed, you can grill at a low heat for hours or open it up to sear steaks with high heat in minutes. With the Weber Original Kettle Charcoal Grill, you have 363 square inches of total grilling space, so you can cook two burgers or a festive meal for a party of six with ease. It’s reliable, traditional, and durable enough to last season after season. The Weber original kettle is unmatched by any other grill at this price. We found only 964 customer reviews for the Weber 22 Inch Kettle on Amazon with an average rating of 4.6 stars out of a possible 5 stars. 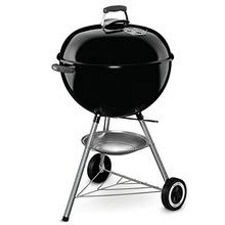 Out of the 870 customer reviews we found, 91 percent of customers rated this Weber charcoal grill either 4 or 5 stars. There was a smattering of complaints about the grill, most of those were shipping problems, late arrivals, and a few factory defects. Amazon and Weber advised customers to contact customer service when they receive defective parts or delayed shipping, but 91 percent of 900+ customers were happy with the grill and the service they received. In summary, it isn’t fancy, it isn’t pretty, but you just can’t beat this grill for the price! If what you crave is great tasting charcoal barbecue for less than $100, you might as well have a Weber.